NOTE: Keep in mind this glowing ingredient is totally edible and natural, but it does have a very bitter taste. Also, some people are sensitive to this ingredient - so to be on the safe side, ensure anyone who will eat the cake will be aware of this ingredient. The amount in this edible ink will be very minimal, but it's always best to give a heads up when using this type of ingredient. ... and that special secret ingredient used was Tonic Water!! 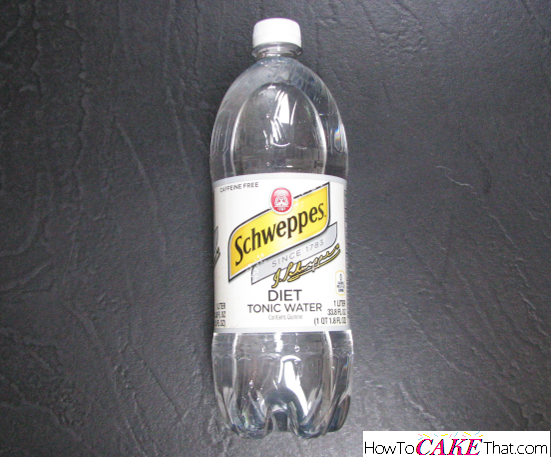 Tonic water contains a natural edible ingredient called Quinine! Quinine glows a beautiful bright blue when held under a black light! How cool is that!! To make an edible ink that will be as clear and hidden as possible, DIET Tonic water must be used. 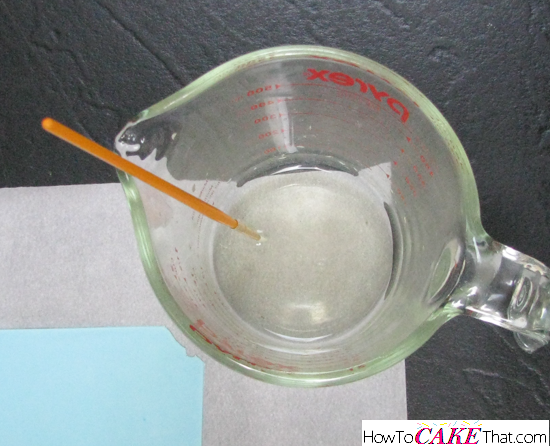 Diet tonic water won't leave a thick sugary syrup on your surface of your fondant like the regular high fructose corn syrup version would. Also, I prefer Schweppes brand! It seemed to glow much brighter than the other brands I tried. But whatever brand of tonic water you choose, be sure it contains "Quinine"! 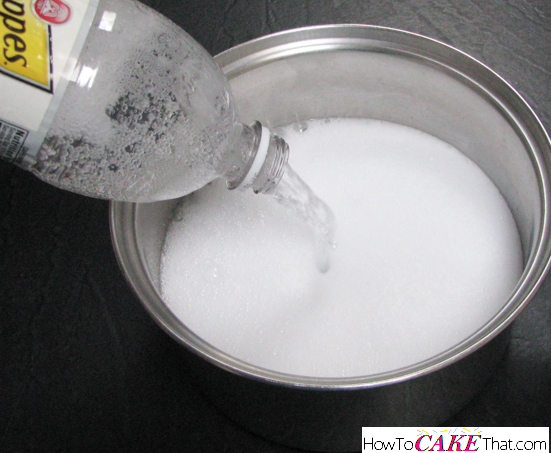 Pour entire 1 liter bottle of tonic water into a medium saucepan. 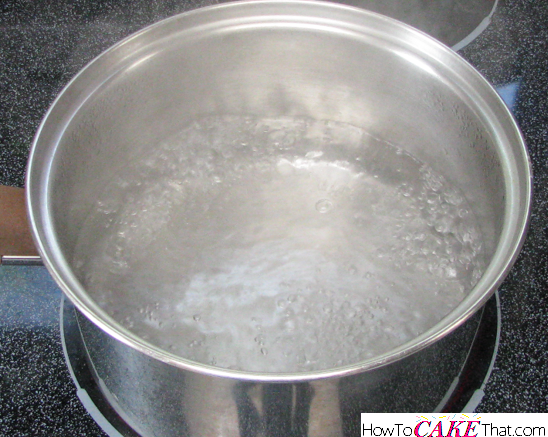 Next, bring the tonic water to a boil on medium-high heat. 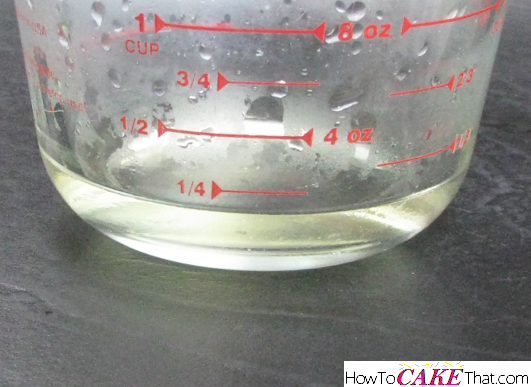 Allow tonic water to boil down until only a very tiny bit of liquid remains. I think I burned my tonic water a tiny bit, and therefore it turned slightly yellow. But that's okay! You won't notice it. Next, I poured my condensed tonic water into a heat safe measuring cup. And as you can see I condensed the tonic water from 1 liter down to just under 1/4 of a cup! So the quinine in this liquid is now concentrated and will be very vibrant when placed under a black light! 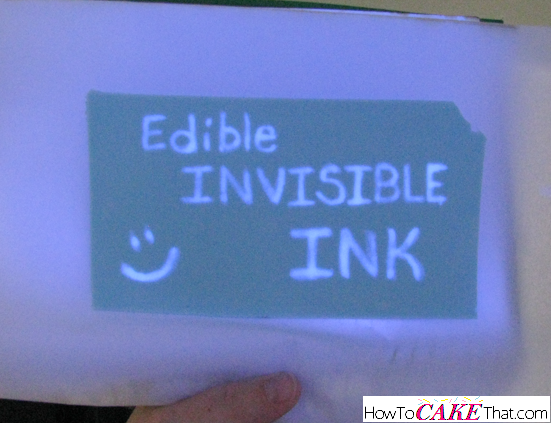 Now it's time to test the edible UV invisible ink! To do this, I rolled out a thin piece of light blue scrap fondant. And I dipped a small paint brush into the condensed tonic water. 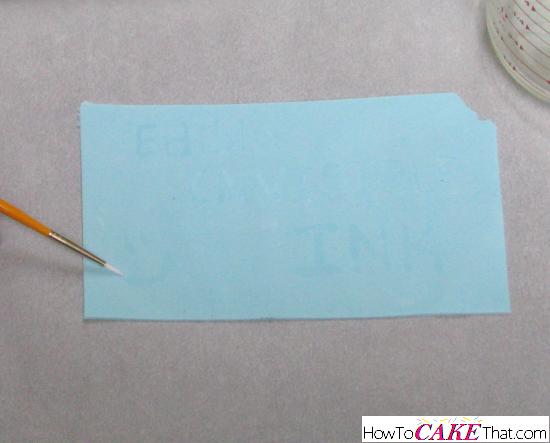 Then I painted my message directly onto my piece of fondant! Painting with the tonic water invisible ink is just like painting with pure water - it is very runny! To keep this watery paint from running, paint a couple thin layers onto the surface and build up until desired glow is reached. 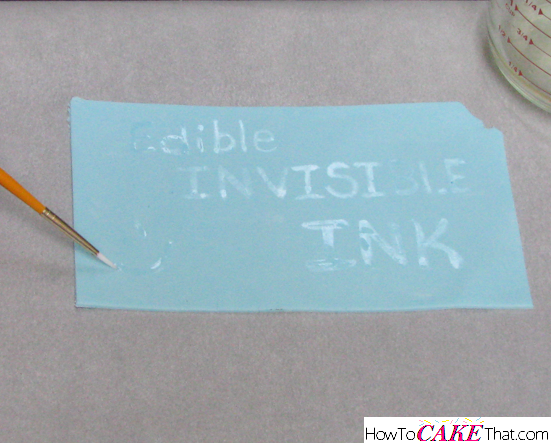 I let my invisible ink dry slightly before adding an extra layer to keep my fondant from getting gummy. 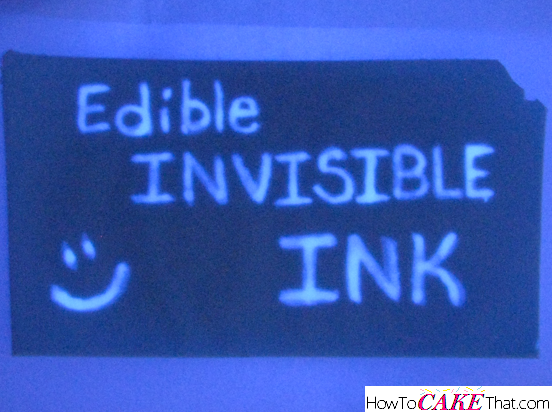 If possible, paint under a black light so you can see how your writing or painting looks as you go. 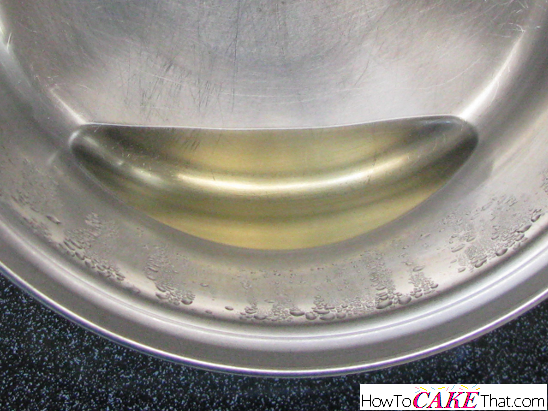 And because this paint is a bit watery, it will leave a shine after it has been first painted (as seen in photo above). But after it has dried, only a dull shine will remain... the shine can be seen at certain angles, but when looking directly on it will be unnoticeable! Even in late afternoon sunlight, it still glows bright under a black light! But it of course works best in a dark room with just a black light on! And the closer it is to the light, the brighter it will glow! I hope you have enjoyed this tutorial! God bless! !